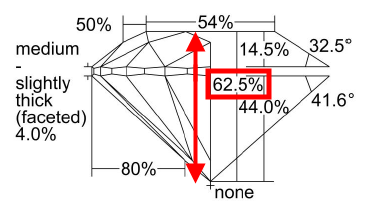 Total depth percentage is the diamond’s table-to-culet depth. On a round brilliant, it’s expressed as a percentage of the diamond’s average girdle diameter. To many people, a 60 percent total depth percentage means that the stone is well proportioned, but this isn’t necessarily true. The total depth percentage combines crown height percentage, girdle thickness percentage, and pavilion depth percentage, so it’s meaningless if any of those three percentages fall outside the “normal” range. Examples would be a diamond with an extremely thick girdle, or one with a very shallow crown and an overly deep pavilion. If total depth percentage is less than 55 percent, the stone probably has a shallow crown or pavilion, along with a large table, shallow crown angles, or a combination of these features. If it’s more than 65 percent, the crown or pavilion might be deep, and the girdle is probably thick. In either case, the proportion variations might affect the diamond’s beauty. While total depth percentage is a good indication of a diamond’s proportions, it can’t tell the whole story. It’s no substitute for careful inspection and analysis of the relationship between a diamond’s proportions.